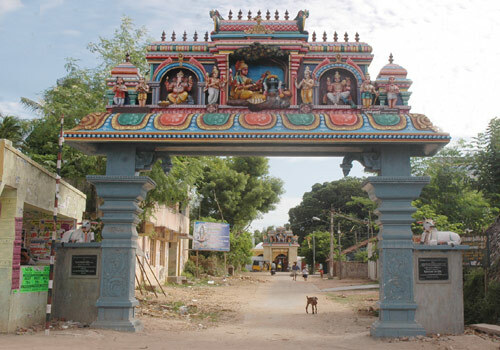 Thiruneedur Somanathaswami Temple is a Hindu temple located at Needur in Nagapattinam district of Tamil Nadu, India. 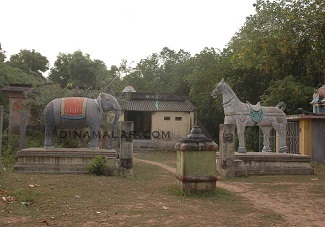 The historical name of the place is Sapthapuri. The presiding deity is Shiva. He is called as Somanathaswami. His consort is known as Veyurutholi Ammai. Due to his sins, a demon Manmasudhan was born as a cancer (nandu in Tamil). He sought advice from Mahrshi Narada for relief. As advised, he came to this place, bathed in Cauvery and worshipped Lord Shiva. Pleased with his penance, Lord granted darshan to him. To facilitate his merger with Him, Lord also made a hole in Himself. Nandu entered into the Linga through the hole and got merged with Lord. The hole is visible on the Linga. Sun God had worshipped Mother Veyuru Tholi Ammai in this temple. As Sun-Aditya worshipped, She is praised as Aditya Varada Ambica. Planet Saturn is opposite Ambica shrine facing east. The devotee can have the darshan of Mother and Saturn simultaneously for removal of the adverse aspect of the planet. There is no Navagraha-9 planets, shrine in the temple. Mother Badrakali in a separate shrine had worshipped Lord in the temple. As a rule in Hindu customs, people worship Lord Vinayaka before commencing any work. They then have to follow the advice of elders. Lord Vinayaka in the temple is considered elder, experienced and adviser. The three aspects are praised as Chintamani Vinayaka, Selva Maha Vinayaka and Shivananda Vinayaka. Any one starting a business prays to Vinayaka in this temple for profitable results. A soldier Munayaduvar by name had an army himself and was assisting Kings in their battles. He spent the income thus earned for the maintenance and renovation of the temple and to serve Shiva devotees. Lord Shiva granted Darshan to Munayaduvar and placed him one among the 63 saivite nayanmars. Besides having his own shrine, he is also the procession deity in the temple. Guru Puja for him is celebrated on the Poosam star day in the month Panguni-March-April and taken in procession. Needur in Tamil means eternal place. As this place could not be destroyed even at the end of the world by the great floods-pralaya, it is named Needur. 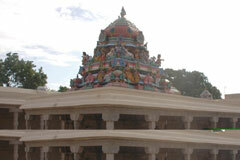 The other names of the place are Vagularanyam and Magularanyam. 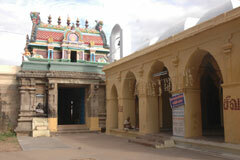 Sivanandeswarar Temple, Tirupandurai, Thanjavur, ..